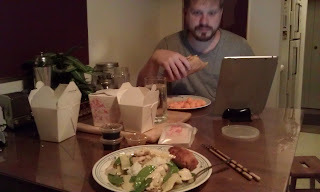 It was a long day today and I wanted was Chinese food at the end of it. So when we were out and about after work picking up pet supplies we swung by and I snagged some Chinese food (enough to feed a small army and I will have leftovers for days) and Chris got a tasty pizza sub. Leftover Chinese food is going to make playing Skyrim all day tomorrow so much easier.